We are thrilled to welcome Charlotte artists Natalie Abrams and Aspen Hochhalter to Pease Gallery for their upcoming exhibition, “Objects in Perspective: Collaboration by Aspen Hochhalter and Natalie Abrams, which will be on view Sept. 15 – Nov. 6 in Pease Gallery. Aspen Hochhalter, a photographer, and Natalie Abrams, a sculptor, met while in residence together at the McColl Center for Art + Innovation, and quickly formed a lasting partnership. They will debut new work in this exhibition: Abrams’ looped and folded latex paint sculptures will sit on pedestals while Hochhalter’s large format (96” x 44”) photographs of the work will line the gallery walls next to original glass plate ambrotypes. On Sunday, September 28 at 4 p.m., Central Piedmont Community College will host the 8th Queen City Soup in Pease Auditorium. “Queen City Soup” is a regional micro-grant program for emerging and established artists and community activists in the Charlotte metropolitan area. This quarterly event seeks proposals from local artists for projects in the range of $1500-$2500. The projects must have some tangible benefit to community, and projects that have a broad public impact are encouraged. Project Art Aid organizes the events, which include food and drinks, an opportunity to meet the artists, and a program where the artists pitch their projects to the attendees. ‘Seth Rouser: Hands Held to Empyrean’ is on view in Ross Gallery through October 9. Reception: Thursday September 4, 5-7 p.m.
bodies of work have influenced my more recent work, paintings of cloudscapes. the visual vocabulary that I use to explore this mystery of what it is, to be. In 2010, researchers discovered bone fragments in Siberia’s Denisova Cave; these fragments were identified as the remains of a young girl of a previously unknown Homo sapiens subspecies. Heather Freeman, a UNC Charlotte art professor, used this discovery as the jumping-off point for her interactive book “Denisovan.” You can (and should) download the app at denisovan.blogspot.com, but at Pease Gallery you can view the project in the form of large-scale digital prints. These prints underscore that “Denisovan” is not dependent on technology – it is, at its core, a story. Whether experienced as an app, a physical book or an exhibition, “Denisovan” is quiet and intense. Filled with contradictory emotions, it includes observations on maternal exhaustion, cruelty and love. “Denisovan” is a complex journey through the idea of what it means to be human. It is deeply researched and deeply felt. Freeman has the confidence not to let her research override her project’s emotional power. Central Piedmont Community College; blogs.cpcc.edu/cpccartgalleries; 704-330-6211; through Sept 4. Please join us for a lecture by the artist on August 28 in Pease Auditorium at 4 p.m.! Heather D. Freeman will lecture on her exhibiting body of work, ‘Denisovan’, as well as past projects, on August 28. Her lecture will take place in Pease Auditorium and will be followed by a reception in the Pease Gallery (adjacent), from 5-7 p.m. 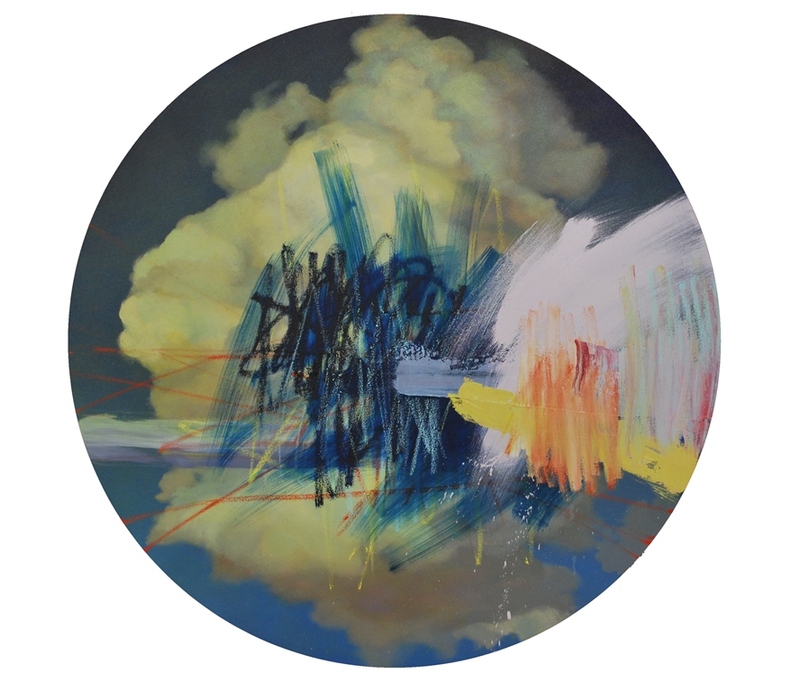 Reception Thursday September 4, 5-7 p.m.
Seth Rouser will present a series of original paintings depicting cloudscapes overlaid with gestural marks and emotive color. These paintings are a manifestation of the artist’s thoughts on time, change, and the human experience. Rouser uses his clouds to symbolize and confront existential issues and the significance of being.